Tiffy in full flower. Odor is very strong at this point (about 2130 on 13 June 2000. Photo by Leo Song. Pollination of Tiffy by Leo Song (L) and Chris Barnhill using pollen from the Huntington Botanical Garden which had been frozen from last year's inflorescence. Note that the spathe has wilted due to the strong sun and heat. Photo by Marybeth Song. Click on image for larger shot. Tiffy on the day after pollination. The spathe had folded up overnight and the spadix had partially recovered from its partial collapse in the late afternoon of 14 June. Tiffy@home (CSUF Biology Greenhouse Complex). The spathe and spadix have mostly dried up. Note the observation window in the lower left portion of the base. Here is a close-up of the window that was cut to observe the female flowers' development following pollination. Close up view of the inside showing female flowers. Note that the stigmas have died. Bad news! The pollination was not successful. Either the pollen was not good and/or it was too late when the pollen was applied. 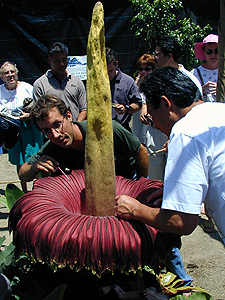 The base of the spathe had been removed to prevent mold. Note that the base of the inflorescence continues to die and now is quite soft. After the inflorescence had completely disentigrated, the tuber was removed from the pot and the soil washed off. Here, the large "D" shaped area was where the inflorescence was connected to the tuber proper. The small white triangular area at "One o'clock" is a new probable leaf bud. Two flowers in a row would exhaust the tuber. Close-up view of the surface of the tuber. Note the numerous small buds or "eyes" that provide a point of growth enabling the tuber to increase greatly in size. Note that eyes cover most of the surface area. These auxillary buds can be a source of new main growing points if the main bud is damaged. Another tuber (#3) given to the collection at a later time was from a tuber that had been cut up into sections. At this time, the tuber was about 12 inches in diameter and weighed about 17.5 pounds. Extreme closeup showing "eyes" or areas of meristematic activity. Some of these areas produce roots. 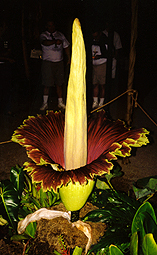 Tiffy was replanted into a larger pot and has begun to show signs of activity (28 August 2000) with a root emerging at the surface. A new leaf will appear in a few weeks. Tip of leaf bud visible in lighter area in center. Roots are the white "worms." 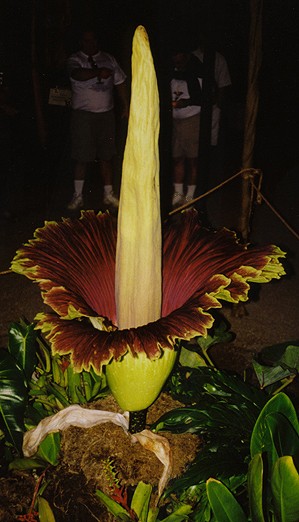 Taffy (#2) was also replanted into a larger pot, but shows no signs of activity as of 06 October 2000.